You're already snapping a million photos of your nugget, now let those pix tell a story. Write your baby's accomplishment on a small chalkboard (Slept through the night!) along with the date, prop it next to her and take a photo. 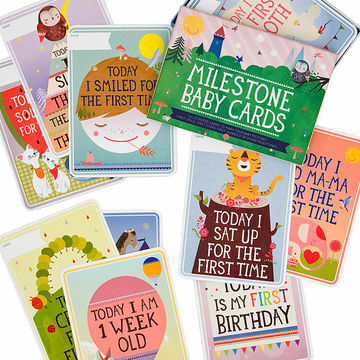 Or you can buy milestone stickers that adhere to baby's onesie or illustrated cards that feature infant achievements. We're big fans of stickers by stickybellies ($14) and cards by Milestone Baby Cards ($26) . 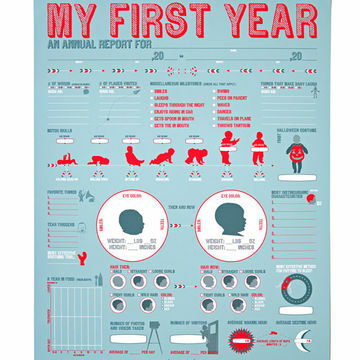 The talented folks at strangebirdy.com/ designed an infographic-esque fill-in-the-blank poster to capture a years' worth of baby memories. Our idea: Photocopy the poster, and hang it in the nursery so you can write as you go. Once you're done, copy the info over to the original print, frame it and voila, decor and keepsake! (You can get one sans baby's name for $45 or one that features your bundle's name and birthdate for $75). Hang a calendar in the nursery with a pen dangling next to it (but out of reach from small hands, of course). Use it to write down any and all milestones and save the calendar as a momento. (You can even get milestone calendar stickers and skip the writing all together.) 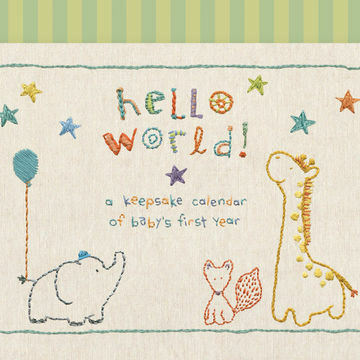 While any calendar will do, you can find baby-specific ones, too. We heart the Made with Love calendar from C.R. Gibson ($15.75). 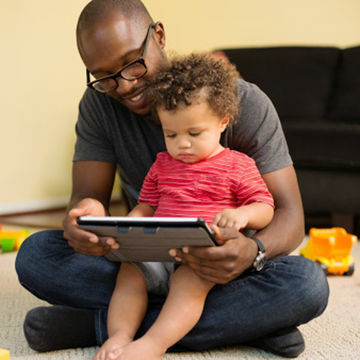 Create an e-mail account for your little one and use it to record and send her big and little milestones. For instance, you can write something like Guess who walked today? !, and attach a photo and a video of the big event. Once your child is old enough, hand over the password and she can relive all of her baby moments. We like the idea of giving friends and family the address, so they can share special times as well.